Dancing with someone is an act of trust. Elegant and intimate; you're close enough to kiss, close enough to feel your partner's heartbeat. But for Vanessa, dance is deadly – and she must be very careful who she trusts . 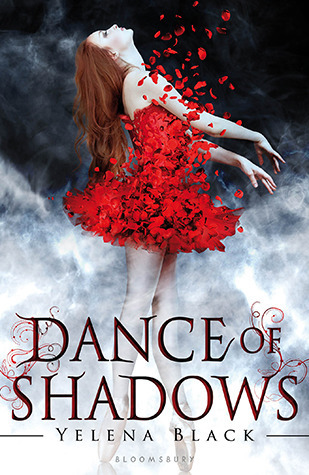 . .
As soon as I laid eyes upon the cover for Dance of Shadows, I knew I was a goner. Everyone's heard of the old saying, "Don't judge a book by it's cover," but to be honest, we all do. At least to some degree. I first heard of Dance of Shadows on The Story Siren about a year ago, and to this day, I still haven't seen a cover prettier than this one. Everything from the breathtaking costume made of rose petals, down to the elegantly scripted font, just screams "Read Me!". Most important of all, at least appearance wise xD, the cover actually pertains to the book. Something that doesn't happen as often as it should in YA novels. The model's pose as well as the mist so ominously surrounding her automatically makes me think she's baring her soul for some sort of possession to take place. Either that, or Ballerina Zombies. Since the synopsis said nothing about the walking dead, I went with my first instinct. xD Sadly, this book does not do this cover justice. The first issue I had was with the characters. Bluntly put, they were all bland and had as much depth as a piece of paper. Not a very good comparison, but I couldn't think of anything better. Don't judge me. >.< I couldn't tell the difference between any of Vanessa's friends, because they all acted the same. Vanessa was likable enough in the beginning, but as the the story progressed, I liked her less and less. There were so many times when I wanted to jump in the book myself and smack her silly. She seemed to be bent on ignoring the ones who only wished to help her and desperately following the ones who acted like complete asshats. She claimed multiple times throughout the course of the book, that her sole reason for attending the NYBA, or New York Ballet Academy, was to search for her sister who seemed to magically disappear off the face of the earth two years ago. Meanwhile, she did anything but. Not once did she do anything productive enough to even remotely come close to her supposed one and only desire to bring her sister home. Most of the time, she just sat around daydreaming about Zep, her dance partner, wondering why he never responded to her desperate phone calls or never answered the door when she knocked. She refused to see the answers right in front of her, and it took her about three quarters of the book to finally realize that something wasn't quite right. The synopsis mentions her gaining the attention of three guys, which makes you think that there's going to be a love....square? But in reality, it's only a love triangle. At least I hope it's a love triangle. There were a few times when Vanessa and Josef became intimate in the art of dance, but considering the fact that the book states he's in his late thirties, I really hope that wasn't what the author was trying to imply. Zep, her dance partner in the Firebird and current boyfriend, was a complete jerk. It seemed as if she fell madly in love with Zep as soon as she saw him for the first time. I get that it's completely normal to find a guy attractive, but not in the way she was thinking about him. As if they were destined to be together and that one glance from the dark and brooding Zep meant that he was hopelessly in love with her as well. He ignored and outright lied to her, and all she did was follow him around like a lost puppy, needy for attention. Justin was a little bit more interesting, but I still never connected with his character. He acted like a jerk at times, but I could still see that all he wanted to do was to keep her from following her sister's footsteps, even when the protagonist could not. Dance of Shadows was also really hard to believe. Girls just happen to mysteriously disappear from one of the most renowned dance academies of the country, maybe even the world, and no one's the least bit suspicious? Yeah, I understand if the police don't want to get seriously involved over one or two runaways, because considering the harsh rules, strict diets, and high expectations, it's very possible for a dancer to get overwhelmed and wish to start over. But were talking about ten girls, maybe more, all who dance the lead role in the Firebird. Am I the only one who finds that a bit sketchy? Despite the negative comments bloggers have made about Yelena's writing style, I have to say that I disagree. I found that it flowed pretty well and never seemed abrupt or awkward like some of the past books I've read by debut authors. I was also bracing myself for the overuse of the word "sweat", but I found that I didn't have a problem with that either. Although she used that word more often than other authors, I never found it glaringly obvious. It was pretty subtle, and if I hadn't been on the lookout for it, I probably would have never noticed it. On the other hand, the action was a bit too slow for my liking. I found myself skipping pages often and only really got interested in the story near the end when the dance was actually taking place. Overall, Dance of Shadows had an awesome theme that could've been brought to life at the hands of a more experienced author. I should've listened to the negative reviews pouring in as soon as it was released, but I couldn't help myself because the cover was just too beautiful for me to ignore. I probably won't read the next book in this series, but I will definitely be anticipating the cover for it. Talk about major disappointments :(. Alot of people have not liked this book, so I think its best for me to stay awaay from this book. Anyways, awesome review and cute blog! Followed back! :D Thanks for following. Yeah, i've heard some not-so-great things about this one. Too bad, because it sounded so good, and like you said, the cover's gorgeous. Too bad the characters were so bland the story was boring. :( Great review though! This was an amazing book it can make your heart race and make you think of things you've never thought before. Once you get to the end you just want to keep reading .